Unlucky number 13, this episode of #SeriousVintage reunites Josh Chapple (@joshchapple on Twitter) with Geoff (@ThallidTosser) and Nat Moes (@GrandpaBelcher) to talk about several Vintage-relevant topics: the new Magic 2014 rule changes, the changing location of Vintage Champs, results from the latest Team Serious Open, previewed M14 cards, the Modern Masters release, and Alinea, a restaurant in Chicago with a nigh unpronounceable name, but amazing food. Having new rules hit Magic the Gathering is generally a pretty big deal, especially in younger formats where the rules affect a larger percentage of the cards. In Vintage, where the players have been around for a while and know to keep their hats on when something changes, the M14 rules update will cause some adjustments, but are easily dealt with. Players will have to adjust to simultaneous Tolarian Academies, Vendilion Cliques, and Jace, the Mind Sculptors, but this adds a level of tactical and strategic depth to games. The big loser here is Phyrexian Metamorph, who can no longer remove Griselbrand, Emrakul, Kataki, or other legends in Workshop decks (it copies them instead, which is debatably worse). Big winners, potentially, include Mox Opal, Gaea’s Cradle, and Thespian’s Stage. Thespian’s Stage now combines with Dark Depths (and two mana) to make a flying, indestructible 20/20 Marit Lage token. This potentially lethal, uncounterable play can be carried out as early as turn 3, often with the help of Urborg, Tomb of Yawgmoth. It works like this: Dark Depths and Thespian’s Stage are in play together. Pay two mana and tap Stage to copy Depths. 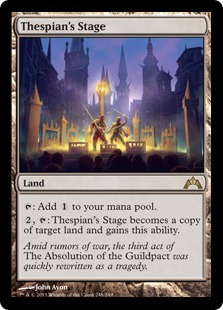 Since Thespian’s Stage is already in play, it will not get any counters; however, since it’s a Dark Depths now, the new legend rule comes into play. Sacrifice the original Depths in response to the state-based effect. The Thespian copy stays in play and its no-counters trigger happens. Sacrifice it and make a 20/20 (and hope they don’t have an answer because you just two-for-one’d yourself). It will be interesting to see if this combo finds a home in a deck, new or old, and whether any other legendary permanents take off as well. We also talk about the new sideboard rules, which have some possibilities but will likely remain largely the same for most players. As we discuss in the podcast, your best odds of naturally drawing a winning combo piece or a critical answer still come with a 60-card deck—not a 61-card deck and definitely not a 75-card one or bigger. Don’t forget: Math, it works! Vintage Champs is Now in…Philadelphia! We jumped the gun on recording this episode by about four hours, but by now serious Vintage players should be aware that the 2013 Vintage Championship is not at GenCon as it has been, but will take place November 3 in the great city of Philadelphia, hosted by the great personage of Nick Coss (of Top Deck Games/Card Titan). We discuss some implications and suppositions about the change in venue in the podcast, but the success or failure of the event still rides on the event itself. Philadelphia is a great host city. I’m sure we’ll talk some about the other attractions, including food and drink, available in the City of Brotherly Love. Now, the question becomes what will happen with Vintage Champs in 2014. Will it be back in Indianapolis, or is Wizards happy to have the players run the tournament. Either situation will be okay as long as everything is communicated early and clearly. Comic Town in Columbus, Ohio, hosted 17 Vintage players for a tournament on May 26, and all had a great time, despite the sudden and overwhelming influx of combo decks to the metagame. The decklists and metagame breakdown are available here. Check those out for sure. We’re trying to figure out some ways to improve the Achievements system and expand its use through more of Vintage. This might mean changing how Vintage Achievements are tracked, when they’re tallied, or what prizes are given. If anyone has ideas, please feel free to post in the comments here or to contact me or Kevin. All credit goes to Kevin for the development and propagation of this fun addition to Vintage tournaments, so if you like the idea or want to use it for your next tournament, be sure to thank him. It’s always exciting when new cards are previewed, and M14 has some interesting ones. Okay, it has one that might actually have Vintage applications, and they’re reprinting Scavenging Ooze. On a previous podcast we asked what was the red member of the 1C cycle that includes Dark Confidant, Snapcaster Mage, Tarmogoyf, and Stoneforge Mystic. 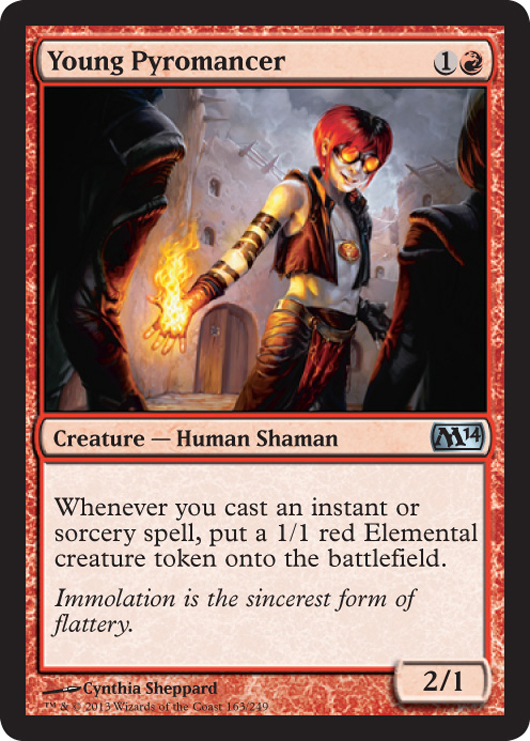 Young Pyromancer, previewed for M14, might be that card. Maybe. It’s an aggressive two-drop that merits some comparison to other Vintage cards like Quirion Dryad, Empty the Warrens, and Talrand, Sky Summoner. Being able to play a Gush list that uses Young Pyromancer would push you into red with answers like Lightning Bolt and Ingot Chewer against problematic Workshop decks. Young Pyromancer itself could give some legs against Lodestone Golem, Smokestack, and Tangle Wire. We looked at some green cards too, none of which was especially exciting, except possibly for best-art-ever nominee, Enlarge. Lol. Cats. Modern Masters is coming out in a couple of weeks now too, with a huge debut in Las Vegas. As we mentioned in the podcast, since MM is a setful of reprints, everything that would make a splash in Vintage has already made its splash. There are some big cards coming out, though, and it will be good to have reprints available of playable Vintage cards that might later draw players into the format. Flat out, Alinea, one of the premiere gourmet restaurants in Chicago, sounds insane, and though no one from Team Serious will be there until Labor Day weekend, we can still talk about it early because it’s just that insane. Their current menu can be found here, so you can see the wildly-punctuated lamb entrée and the balloon and the wooly pig and everything else we talk about. Total cost for this meal, per person (including tax and tip), is $325. And it just might be worth it. If you’re interested in reading more about Alinea, Josh recommends reading Life, On the Line, by the restaurant’s chef and owner, Grant Achatz. I realize we should be doing more to promote other peoples’ tournaments too, so if you have an event you want publicized, let us know. If we record with enough time before the event, we’ll try to give you a shout out. You can send tournament announcements to seriousvintagepodcast@gmail.com. On that note, there’s an upcoming Ohio tournament in Sandusky on June 22 at the Hero Zone. I highly recommend these tournaments as a great way to get into the format as a casual, though competitive environment. Details can be found here. What card in the history of Magic has drawn players the most cards? What card in the history of Magic has dealt the most damage? What creature in the history of Magic has dealt the most damage? What Vintage card do you see get misplayed most often? What Vintage card do you hate but you play anyway out of obligation because it’s too good? What’s your favorite Magic card? What’s your favorite Vintage card?